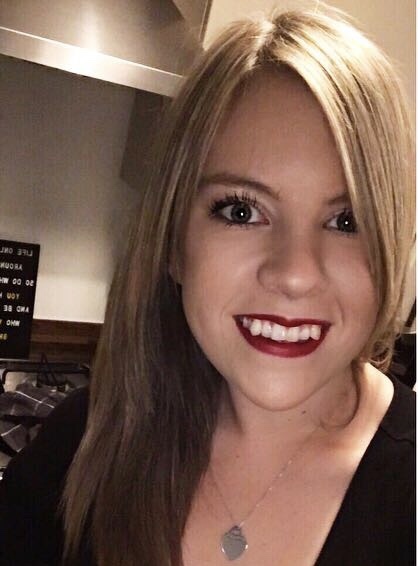 Girl Up North: FOOD & DRINK | DOES LOW CALORIE ICE CREAM ACTUALLY TASTE LIKE ICE CREAM? FOOD & DRINK | DOES LOW CALORIE ICE CREAM ACTUALLY TASTE LIKE ICE CREAM? Low calorie ice cream seems to be one of the latest things to hit the UK from across the pond, with a few different brands popping up offering seemingly 'low calorie' ice cream meaning you can eat the whole tub and feel relatively no guilt. Now I wanted to put a couple of these to the test because I had my doubts as to whether a low calorie ice cream would taste as good as a 'normal' ice cream. To be totally honest before I met Kev I never really ate ice cream but since being with him we've often bought a tub as a treat. However, we quickly realised that the treats were becoming a little too frequent so we needed a lower calorie alternative. 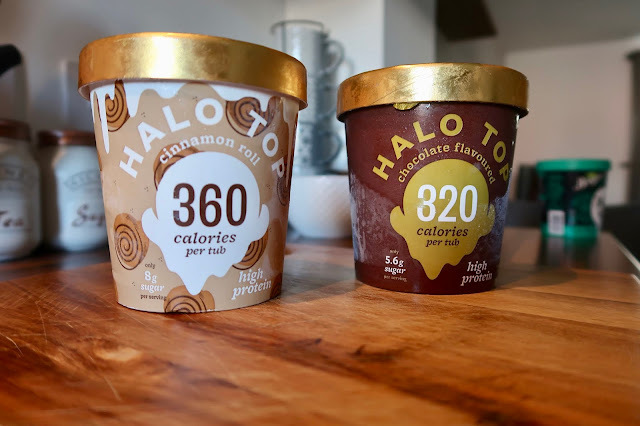 We decided to pick up a couple of tubs of two different brands of low calorie ice cream; both brands seemed to have a full range of ice cream flavours at under 400 calories per tub. Both brands claim to be high in protein and lower in sugar which naturally you would assume as the calorie content is pretty much half of what is in Ben & Jerry's. 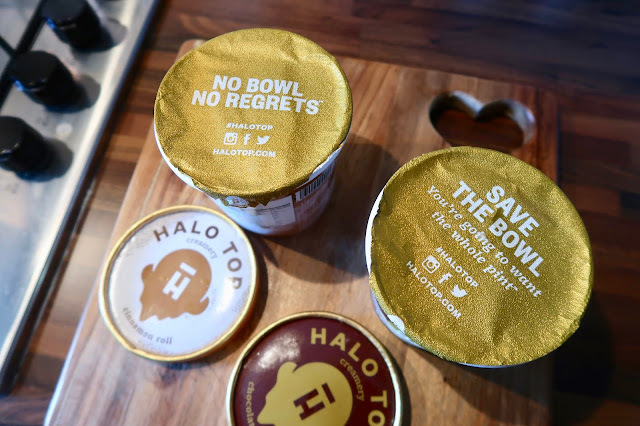 So first of all let's have a look at Halo Top: out of the two the packaging has a more premium feel than the Breyers tubs both in colours and design and also for the fact that they have a foil lid whereas the Breyers tubs don't. The values are pretty similar, although you are getting 27ml less ice cream in a tub of Halo Top than Breyers so that's something to remember. I did wonder whether they'd pack this low calorie ice cream full of artificial sweeteners but thankfully, both brands use Stevia, an organic sweetener which softens the blow somewhat but I can't find any information about specifically how much sweetener is used in each of these tubs. On first impressions, Halo Top is easier to scoop from the tub whereas Breyers is spoon-bendingly hard to get out unless you leave it to melt for a little while on the kitchen side; I did wonder whether this was due to a lack of something that higher calorie ice creams usually have - maybe more cream or something. Halo Top chocolate ice cream (and the cinnamon bun one, actually) tastes quite powdery in my opinion; it doesn't have that creamy texture that you expect from ice cream, and the chocolate flavour isn't very strong at all. The cinnamon bun flavour does have more flavour to it but that's possibly because cinnamon is a naturally stronger taste so it comes through more easily. Cinnamon bun also has some cookie-dough-like pieces through it which did make it taste slightly better but in all honesty cinnamon isn't my favourite flavour and I was a little gutted by my silly mistake (the tubs are very similar so make sure you double check the flavour before you buy!). Breyers chocolate is a lot creamier and has far more flavour than Halo Top; it doesn't have that powdery texture at all and tastes a lot more like higher calorie ice cream. 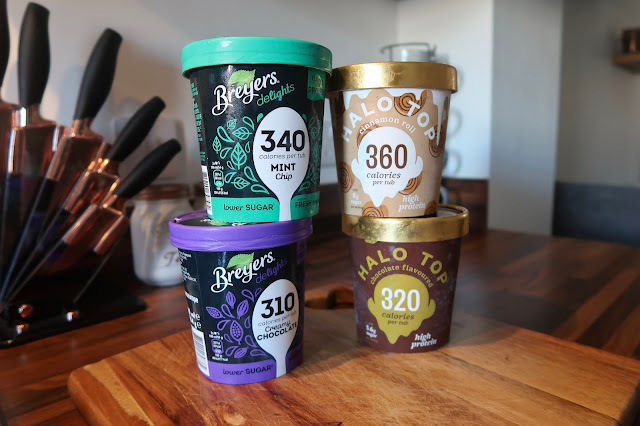 It is harder than the Halo Top as I mentioned earlier which means it's not as easy to scoop out but I can totally overlook this and use a stronger spoon for the sake of a better flavour payoff. The mint chocolate chip is also pretty amazing and has plenty of little chocolate chips in it; it's whiter than you usually find mint chocolate chip ice cream, presumably because they haven't used artificial colourings to make it green but it's still a really minty, enjoyable ice cream. Both ice creams currently £5 per tub in Tesco but you can often find them on offer. You can also buy both brands in Asda and Sainsbury's. 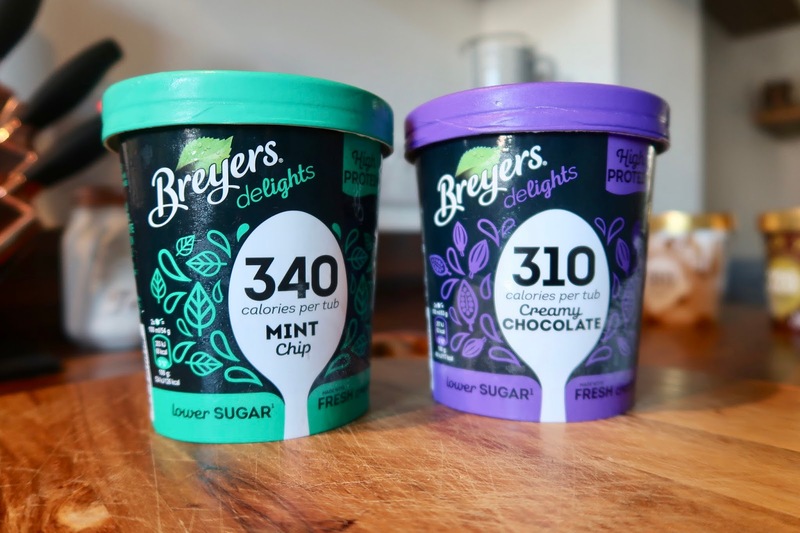 I would personally recommend Breyers out of the two and I can definitely say that this low calorie ice cream definitely tastes as good as calorific ice cream.